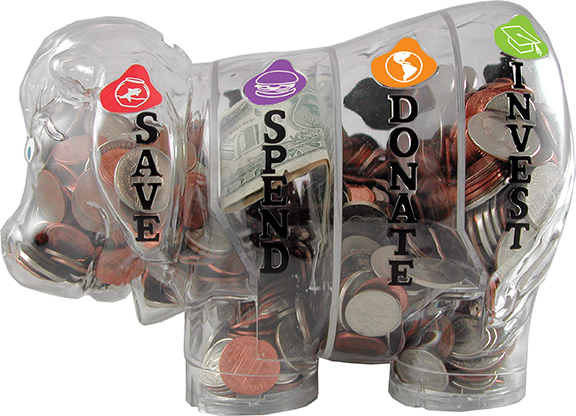 Meet the Money Savvy Pig's cousin, Moolah The Money Savvy Cow. Personal finance education needs to start young. How? With a bank designed for the 21st century. Designed just like his cousin, the Money Savvy Pig, Moolah the Money Savvy Cow has four chambers, just like real cows have four stomachs! There is one chamber for each of the four money management choices a child should be taught from the time they are small. They are SAVE, SPEND, DONATE, and INVEST. See a product review from this Mommy Blogger. When you give children the Money Savvy Cow, you give them control over the money in their lives. In a respectful way, the Money Savvy Cow asks children what they think is the best choice and allows them to make it. A sense of control leads to a sense of security. In today's world, kids expect things to be interactive. Like the Japanese saying goes, Tell me and I'll forget...Show me and I'll remember...Involve me and I'll be changed forever. The Money Savvy Cow involves the child, but on their terms. This involvement will give them good money management habits that will last a lifetime. Just as new drivers are given lessons to learn how to control a car, your child should have a Money Savvy Cow to teach them how to control money, one of the most powerful forces in life. Each chamber exits through a different foot!! A sheet of goal setting stickers to help kids track the goal for each of their money choices, plus different eye colors so that kids can personalize their cow. Easy to follow instructions and tips for each of the four money choices: SAVE, SPEND, DONATE, AND INVEST. 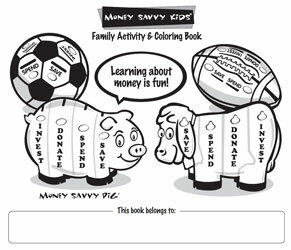 Click here to learn more about Money Savvy Kids @Home, featuring the Money Savvy Cow. 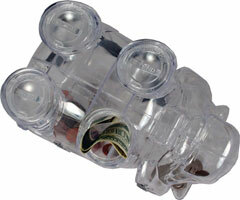 You will find these items behind the Spare Parts icon, under products for kids.